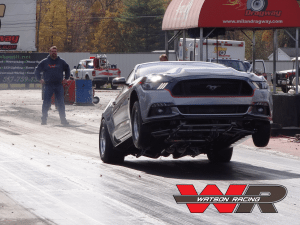 Watson Racing rips off a pair of 8.70 passes in its IRS-equipped Mustang S550 at Milan in 2015. Watson Racing’s 2015 street/strip Mustang S550 project, run the first 8-second e.t.’s in an S550 with an independent rear suspension. However, the company wasn’t satisfied with those runs. 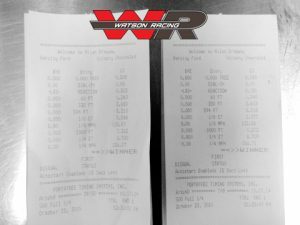 That’s right, Chuck Watson Sr. was able to improve upon his 8.90-second passes by a full two-tenths. Due to the fact, that this time he was running at nearby Milan Dragway and the conditions were quite favorable. 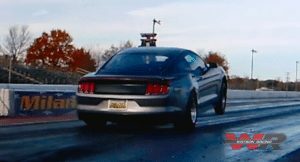 Did you ever think you would see a 2015+ Mustang S550 hook this hard with an independent rear suspension and drag radials? Chuck Watson Sr. cut impressive 1.24-second 60-foot times in his street/strip ’Stang at Milan Dragway. SVT Performance has been following the progress of this car since the project began before last year’s SEMA Show. This included the additions of a Whipple supercharger, FAST EFI, lightweight windows, a bolt-in 9-inch IRS, and a 10-rib blower drive. On the eve of this year’s show in Las Vegas, the Watson team made two more test passes and the car ran even quicker. 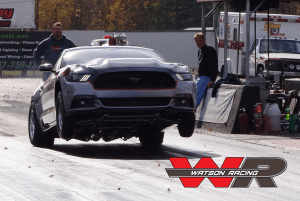 Watson Racing’s 2015 Mustang S550 project ran with bracket-like consistency. Because in its latest two test passes, running back-to-back 8.70s at 156 mph! However, running this quick through a full exhaust on street tires, the Whipple-supercharged machine is clearly impressive. What’s even more impressive is that there are likely even quicker times in the offing.